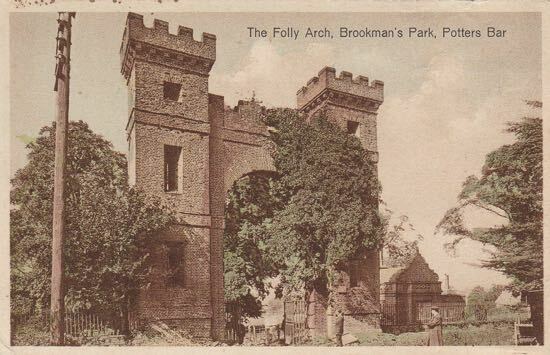 On July 11, 1891, fire swept through and eventually destroyed Brookmans, a large country manor house standing in grounds that now make up the golf course and much of the surrounding area. Staff tried to rescue as much as possible from the mansion that gave its name to Brookmans Park, some valuables were saved, but much was lost. Now, thanks to research by this site's resident historian and archivist, Peter Miller, some of those paintings, which were presumed to have been destroyed, have been traced - to Australia. This is the story of a collection of paintings that survived the destruction of Brookmans, was put in storage for 60 years, and which is still being enjoyed, more than 120 years later, on the other side of the world. The house and contents of Brookmans were owned by the Gaussen family, who bought the property more than 100 years earlier in 1786. The Gaussens were successful landowners who profited from farming. Over the years the family had bought a number of artworks which were displayed in the family home of Brookmans. Staff were employed to manage and maintain the home. "... the butler Joseph Warner, footman Job Burr, upper housemaid Emily Gatland, under housemaid Fanny Starsmore, laundry maid Margaret Lambert, under laundry maid Emma Tyrrell, scullery maid Annie Swan, coachman James Cheeseman, grooms Ernest Arnold and William Brown, head gardener Andrew Grant, and gardeners Charles Knight and William Brown, not to mention his agent, Archibald Gorrie who had served his father before him. Hardly any of these were local people, only Job Burr was a native of the parish." Peter Kingsford then goes on to describe the fire that the staff and local fire fighters tried, in vain, to put out. "... in 1891 the mansion was totally destroyed by fire. Fire engines galloped up in due course from Hatfield, Hertford and Barnet, but only when the third arrived was there a sufficient length of hose to bring water on to the flames, and by then it was too late. Melting lead from the roof poured down the walls and the whole building became a glowing furnace. "The loss of the 17th century mansion and its contents must have been severe. According to the Hertfordshire Mercury some valuables were saved: oil paintings from the drawing room, library, billiard room, dining room and sitting room, wine from the cellars, plate and documents from the strong rooms, fine books from the library, guns from the study and the smoking room, but "curios and articles of vertu of immense value" perished. The origin of the disaster was believed to be a painter’s spirit lamp. There was some compensation when the vestry reduced the rate assessment from £225 to £75. "The domestic servants also lost; they had moved into the mansion while the family were away and their belongings went up in the flames. There may well have been insurance but the mansion was never rebuilt and it was the stable block which was converted into the family residence, later into flats, and eventually in 1929 into the present golf club house." Peter Miller's research led to The Hamilton Gallery in Victoria, Australia, where some of those paintings are hanging - still in their original frames - in what is described as, "an elegant recreation of an English drawing room" situated in the Gaussen Gallery. The Hamilton Gallery, which has kindly given this site permission to reproduce details of the artwork takes up the story on the page on its site which features the collection. "In 1971 the State Government of Victoria generously made a special grant available to the Hamilton City Council for the purchase of the Sandby Collection then belonging to Mr Charles Gaussen, of Gringegalgona. "The collection was formed by Samuel Robert Gaussen (1759 - 1812), a wealthy London banker, probably in 1801. 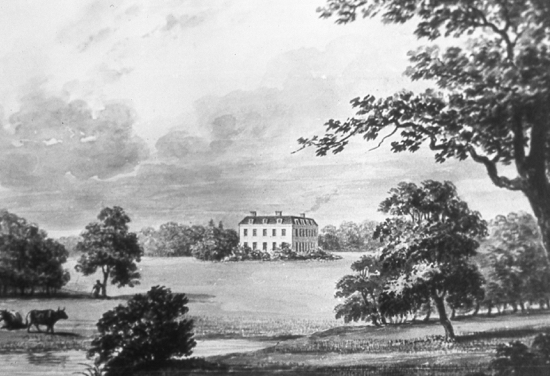 "In 1786, Gaussen had bought a notable country property named Brookmans, Hatfield in Hertfordshire. Unfortunately, in 1891 a fire destroyed the main house at Brookmans, and, with it, much archival material, so it is difficult to delineate the precise details of how Gaussen acquired his Sandbys. It is known however that Samuel Gaussen had loaned money to the art dealer Antonio Poggi who by the end of the 1700s had run into financial difficulties. 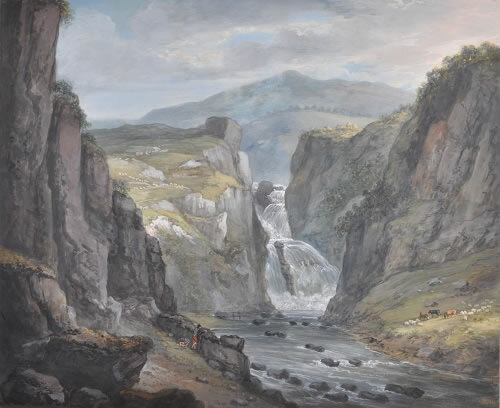 Poggi had a large collection of Sandby works and it seems likely that Samuel Gaussen had acquired these around the time of Poggi's public auction in April 1801. "In the 1920s members of the Gaussen familty moved to the district. The Sandby collection had been in storage in the U.K until 1951 when Charles Gaussen arranged the transport of them to Australia, the process having been delayed by the Second World War." Below is a selection of some of the collection of paintings salvaged from Brookmans as fire engulfed the house in 1891. All are included with the permission of the Hamilton Gallery. Below each picture is the description of the piece as set published on the gallery site. Hamilton Gallery notes: "Purchased with the assistance of a special grant from the Government of Victoria 1971. 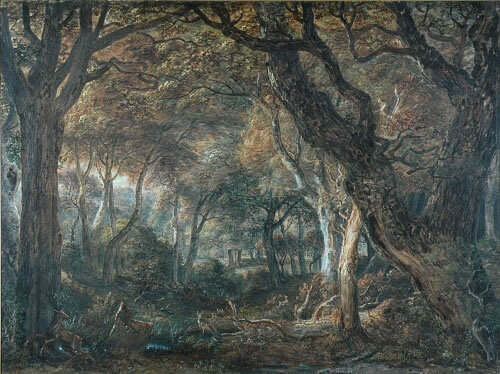 Windsor Forest, at the foot of Windsor Castle, was one of Sandby's favourite themes. Indeed, he developed a speciality in landscapes prominently featuring gnarled and convoluted trees. With its free and atmospheric approach, this work is typical of his late period. The rich autumnal colouring and impressive attention to detail recall the landscapes of the 17th century Dutch School. This is the artist's largest recorded work." Hamilton Gallery notes: Purchased with the assistance of a special grant from the Government of Victoria 1971. Warwick Castle is situated on the River Avon. Sandby was a friend of its owner, George Greville, who became the 2nd Earl of Warwick in 1773, and his brother, the Hon. Charles Greville. 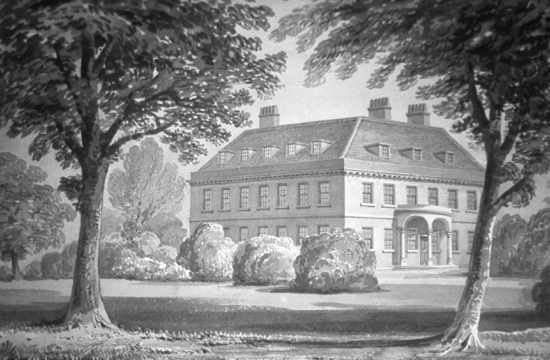 The two brothers were pupils of Sandby at one time. In this work, Sandby utilises his skills as an architectural draughtsman, and by casting most of the building in deep shadow, he insists upon its brooding grandeur, and thus it's emotional possibilities. But Sandby never fails to lose sight of a human context, here embodied in the foreground figures. 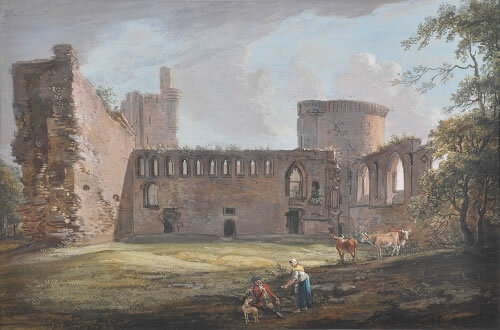 Sandby made numerous drawings of this famous English castle. 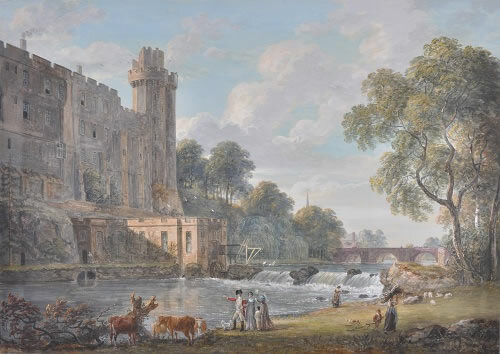 Hamilton Gallery notes: This Irish scene, considered a great beauty spot in the eighteenth century, is another example of Sandby working up a major work from a sketch supplied by the amateur artist, John Dawson. The Falls are now under a hydro-electric dam! It is worth noting the figure leaning on the wall at the left, typical of Sandby, where he portrays the interaction between man and nature. The picturesque sensibility was one of actively relating to, and being involved with, the landscape. Hamilton Gallery notes: In the 1747, Sandby was sent to Scotland as a draughtsman for the Board of Ordnance. He was one of several topographers charged with supplying accurate topographical drawings to the English army. 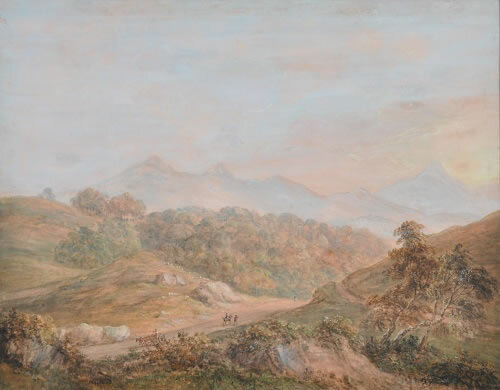 When not engaged in the production of finished copies of maps and topographic views, he devoted most of his energies to sketching the countryside and its inhabitants, thereby building up a repertoire of figures and subjects that he was able to draw upon for the rest of his life. Hamilton Gallery notes: Sandby's tours through Wales in the 1770s were critical in opening English eyes to the beauties of that country. Cader Idris with its dramatic forms was considered one of the most splendid picturesque places the traveller would encounter on the Welsh tour. At the base of the mountain nestles the small town of Dolgellau. 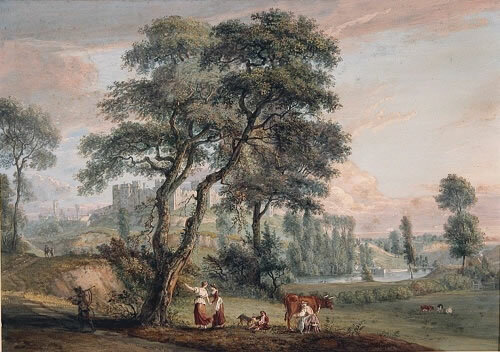 The picturesque aesthetic dominated English landscape painting in the second half of the eighteenth century, and Paul Sandby was one its principal exponents. In the simplest terms, the picturesque sought out those dramatic vistas, those irregular, broken aspects in the landscape, seamed and roughened by the dilapidations of time, which excited the imagination of the viewer to admiration or reverie. Hamilton Gallery notes: This work seems indebted to the works of the Italian landscape painter, Marco Ricci, in both the classical balance of the landscape with its ordered distances, and the use of decorative Arcadian figures in the foreground. Sandby had a significant collection of Ricci gouaches, which would have served him well as models for works like this English view. 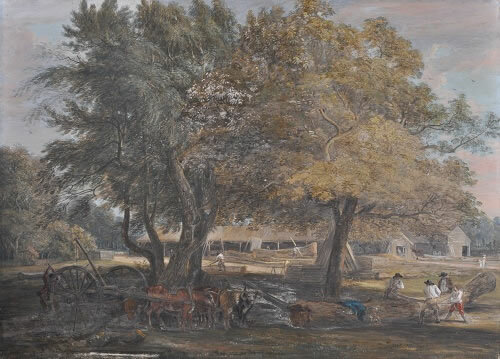 Hamilton Gallery notes: Hamilton Gallery notes: Sandby spent much time in the environs of Windsor and did many drawings of the Wood Yard. Curiously, and without any apparent explanation, almost all of Sandby's drawings of the Wood Yard are signed and dated 1792. Occasionally, Sandby made experimental works in which he combined the two media, as here, of oil and gouache. In this work the effect is far from successful. There is general discolouration, and the image, especially in the foreground, tends to disappear into the canvas. The use of canvas is rare in Sandby's work: invariably he used paper and card as support. He was a keen observer of the human condition at all levels, and did many studies of workers at their daily activities. 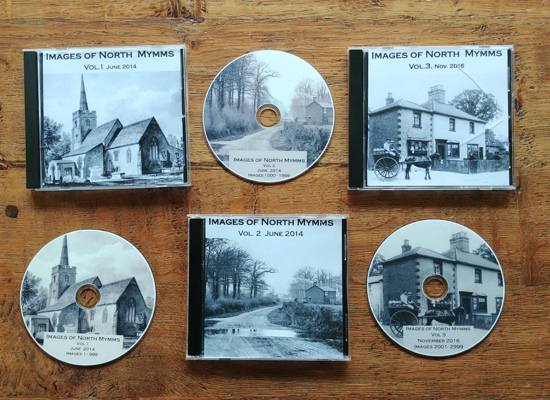 The North Mymms History Project would like to thank the Hamilton Gallery for allowing us to reproduce the information about the artwork and share it on this site.